PARK SLOPE — Karen Paperno has helped thousands of breastfeeding women find the support they need by fitting them with nursing bras — and now those grateful customers want to offer her a different kind of support. 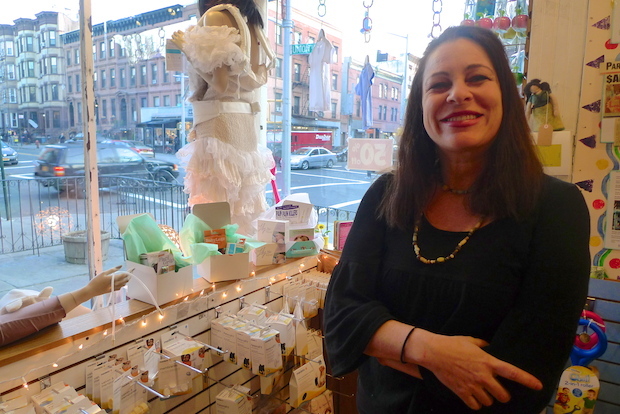 Paperno's Boing Boing shop, a breastfeeding and baby boutique on Sixth Avenue and Union Street, has been buoyed by the aid of local families and others in the wake of a series of financial hardships that have prompted her to consider closing the shop. After Paperno revealed her plight in a Huffington Post essay, Park Slope parents sprang into action, volunteering to create a viable website for the store and offering free marketing and publicity advice. Other supporters have donated cash. One woman brought a gift for Paperno's daughter. Park Slope Parents blog founder Susan Fox broadcast Paperno's troubles, calling her the "unsung hero" of the neighborhood, and urging the parenting groups's 5,000 members to help Paperno. One mom suggested that everyone whose life has been touched by the store donate $10. "I'm floored by their response," Paperno said. "I'm so grateful. It’s the last thing I expected. Who am I? I own a store. There’s definitely people a lot worse off than me." Now she’s not sure what her next step will be, but she'd like to make one last attempt to save Boing Boing before making the final decision to close it. She's considering an online fundraising campaign to raise between $10,000 and $20,000 to put the store on a profitable path. Paperno, who has no formal business training, opened the shop 17 years ago because she wanted to provide a resource for moms like herself who struggled to breastfeed. With her warm smile and forthright manner, she's a natural at counseling new parents. The store carries a boggling array of breastfeeding accessories and nursing bras that go up to a J cup. "It really makes me happy when women get the right bra," Paperno said. "You can't think if you don't have the right support." Boing Boing also stocks a variety of baby supplies, but Paperno says she strives to make the store a carefully curated island compared to the consumer tidal wave that engulfs new parents at big-box retailers like Buy Buy Baby. Paperno's own two children are now in their teens, but she stays up-to-date on newborn merchandise and researches products' safety records and environmental impact. She won't sell things that she doesn't believe in, even if it means rejecting popular items such as Bumbo seats, Boogies Wipes, or the Baby Bjorn, which Paperno believes isn't good for babies. Paperno's strong opinions are infused in the store, which offers a discount for lesbian moms and bears the cheeky tag line "At your cervix since 1996" on its front window. Paperno was dealt a major financial blow when she opened her second store in 2008, just as the economy crumbled. That store failed, and Paperno lost her investment. That same year her husband was diagnosed with cancer. He's cancer-free now, but the family is still paying medical bills. The money troubles mean all of Paperno's sales go to meeting her basic needs, rather than restocking Boing Boing's shelves. But armed with the morale boost from her neighbors' support, Paperno's hoping she can turn Boing Boing into a thriving business. "I want to give it one good shot before I go," Paperno said. "It seems like there’s a lot of support out there, and [Boing Boing] is necessary and essential...Rather than letting my frustration end it all, I can get some help, and see if I can make the store blossom as it should."